I’m not normally a fan of experiments that I make myself from scratch. I have always been a better editor than a creative, and that extends to cooking. I can take a recipe, make it healthier, and have it taste good. But come up with the recipe on my own? Not so much. That’s why this is so surprising, and I am delighted to present an original recipe for once! This salad was created on the fly one morning when I had too much zucchini, and needed to make a quick salad for lunch at work. 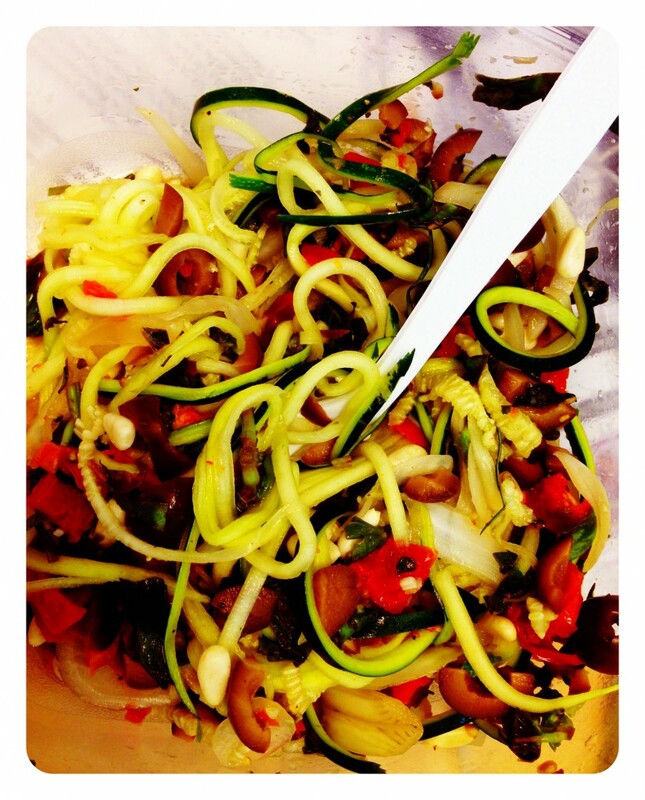 It’s become a zucchini favorite, as I like zucchini ‘noodles’ so much more than any other way. Using a julienne peeler, peel the zucchini in strips so that they look like noodles. Slice the sun dried tomato into strips and finely chop the olives and fresh herbs. Throw in slices of the pickled onion and the pine nuts and spice everything with the garlic powder and pepper. You most likely will not need salt as that’s provided by the olives, onions, and tomato. I like to let this rest for at least a half an hour. When you are getting ready to serve, you can optionally microwave for 30 seconds to a minute if you’re like me and don’t like cold noodles very much. It’s only 244 calories, but packed with vitamins and fiber.